Straight hair is extremely versatile when it comes to styling. Here are three ways to do straight hair that will take you less than 10 minutes. This style is easy to whip out in under two minutes, if we’re being honest. All you need are a few bobby pins. Take a small section on either side of your head and twist them around the back to meet each other. Overlap the two twists and pin in place. Optional: Mist any flyaways with hairspray and apply dry shampoo underneath to add volume. This style would also look great with beachy curls, so if you have wavy hair, don’t bother straightening it! Long straight hair is incredibly easy to braid. For a quick ‘do, part your hair on the side and braid it in your style of choice — traditional, fishtail, waterfall, or even French. Mist it with hairspray to catch flyaways, and you’re good to go. Explore our gallery of long tousled hairstyles with braids and twists for more ways to do straight hair. It’s probably been long enough since Star Wars came out that you can wear your hair in a braided updo without being reminiscent of Princess Leia. Separate your hair into four sections — two small ones on either side of your face, and two large ones in the back. Braid all four sections, then wrap the two small ones around the back of your head to meet one another, securing them with bobby pins. 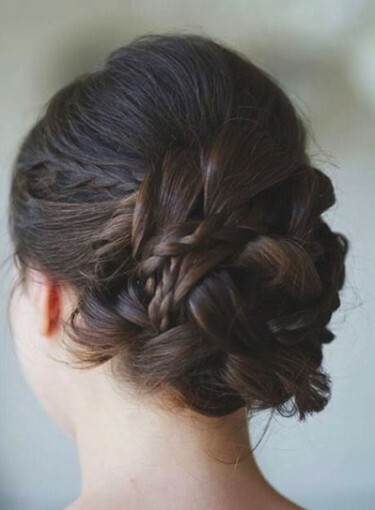 Fold the larger braid in half and pin it diagonally across your head. Repeat with the other braid. These braiding tutorials offer even more ideas for ways to do straight hair.